Experiment time. Reheat coffee, use leftovers or do as I did and make some in a roasting pan with about 2-3C boiling water and 4 heaping teaspoons of coffee grounds. Leave that to sit for a while and stuff lemon slices under the skin of the chicken. I had to work my fingers under it first to create a pocket. Season both sides of the stuffed chicken legs and arrange in the roasting pan. 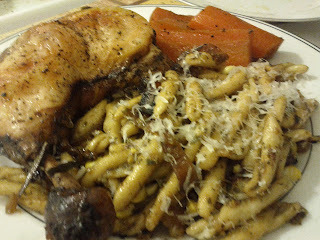 Add 2 carrots chopped roughly and several sprigs of rosemary around the chicken. Bake at 450 for 20 minutes, then at 350 for another 30 minutes. Take them out of the liquid to rest for at least 5 minutes before eating. 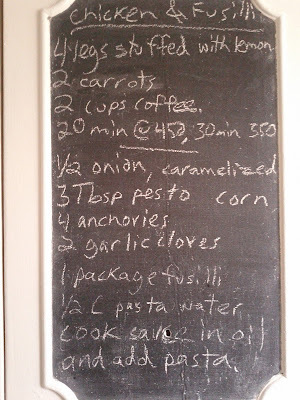 To start the sauce caramelize half a large onion in olive oil in a skillet. 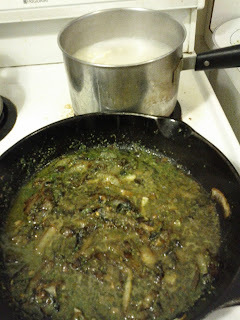 When it is nice and brown, add chopped garlic, pesto, anchovies, and a ladle of pasta water to make it all sauce like. 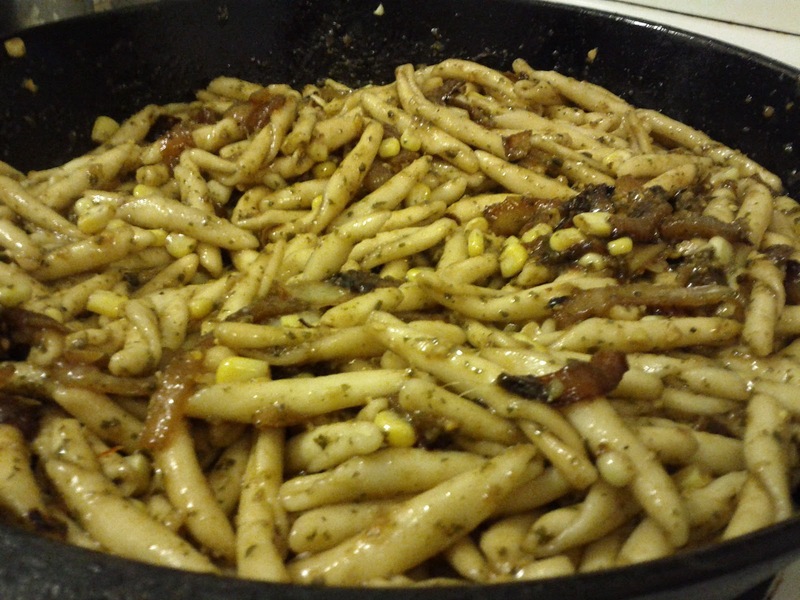 Add corn sliced and scraped from the cob. 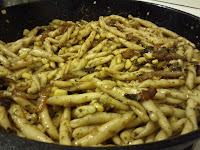 Add cooked pasta and mix well. 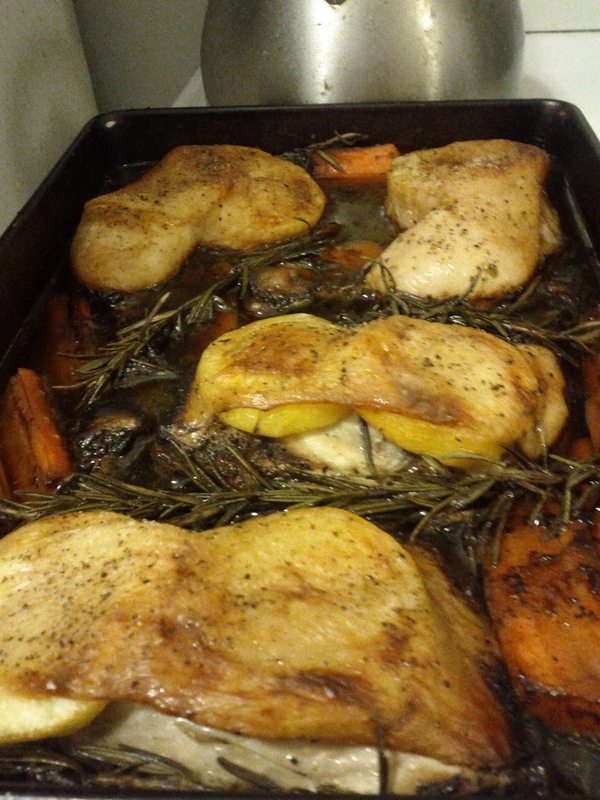 Serve with chicken and coffee flavoured carrots. 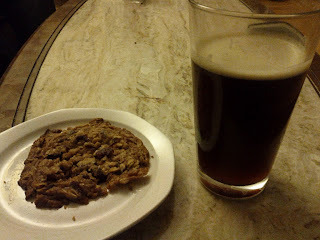 Round off the meal with a nice cranberry skor oatmeal cookie and a glass of home made amber ale.